A comedy doesn’t have to be soft-centred; this one has a heart of flint. The barbs are cruel, the emotions wintry and the ambitions utterly self-seeking, often concealed behind masks of smiles, wigs and gushing words of flattery. 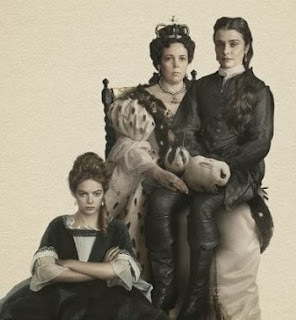 As one perceptive critic has already said, The Favourite is set in what seems like a playground that turns into a battleground that soon becomes a prison. The moment is shortly after the beginning of the 18th century, almost nine decades before the onset of the French Revolution. This is a time when the English monarch still hung on to a degree of power that would be unimaginable now. Queen Anne (Olivia Colman) is, at heart, a lonely petulant child, in poor health, albeit worthy of sympathy as she has given birth, unsuccessfully, to 17 children. In their place are pet rabbits that gambol around her chambers. She has to be humoured, petted, flattered, nursed and pleasured. Sarah Churchill, Duchess of Marlborough (Rachel Weisz), does that, and more. A political manipulator of note, she is the effective power behind the throne while her military genius of a husband, John Duke of Marlborough, fights abroad in the War of Spanish Succession. This film is about how that balance of power shifts when Sarah’s impecunious, unheralded and much-abused cousin, Abigail (Emma Stone), arrives at court and begs for a position so that she can begin a new life. Sarah is dominating, blunt and scathing while Abigail is flattering, subtle and retiring. Both, however, are very palpably out for number one, although the respective prices they have to pay are considerable. This is a wonderful film, partly because of the scintillating original script by Deborah Davis (polished up by Tony McNamara); partly for cinematographer Robbie Ryan’s stunning images, using a lot of wide-angled shots that create a feeling of claustrophobia; partly for the baroque music and sound design and partly for the brilliant direction of Lanthimos. But the acclamation has to be loudest for the tremendous performances of the three women at the venomous heart of this movie. Colman, Weisz and Stone are perfect pieces in this regency jigsaw. It’s so hard to separate them, but Colman is the central figure, around whom the two other women circle like moths. It’s worth mentioning that in this time of #MeToo consciousness, in which the so-called male gaze is being increasingly questioned, this is a film about three fully realised female characters, grasping for power. Not one of them is particularly sympathetic, but they are all recognisably real and fascinating. By comparison, the men are nowhere.